On June 6th, 1998 Jack Leconte's Larbre Compétition fielded a very promising black 911 Porsche in the GT2 class at the 24 Hours of Le Mans competition. Driven by Jean-Pierre Jarier of France, Carl Rosenblad of Sweden, and Robin Donovan of Great Britain the car pushed its way around the course through 164 laps before a transmission failure took it out of contention in the 13th hour. The car finished in 34th place overall and 12th in the GT2 class, but it looked marvelous. 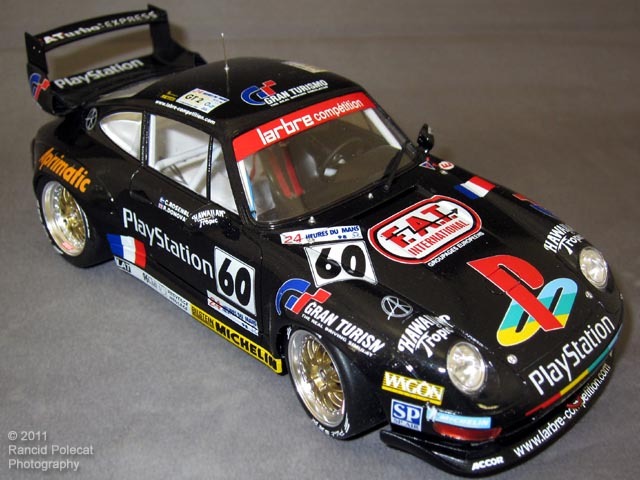 The car's colorful sponsorship decals and bright white interior turned what could have been just another plain black Porsche into a visually striking race car that caught the attention of our own J.C. Reckner.